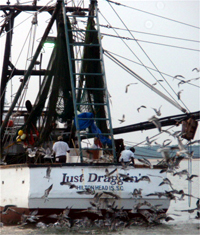 Exploring Nature under sail is “the environmentally friendly way” to enjoy the beauty of Hilton Head Island and the surrounding waters and natural habitat. Advanced Sail Inc. has been providing unforgettable fun dolphin watch nature cruises on safe and stable catamaran sailboats since 1989. 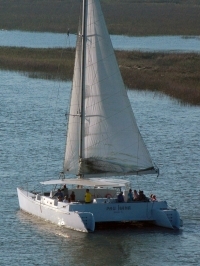 We sail in the protected waters of the Calibogue Sound and Intracoastal Waterway. These truly unique “pure sailing” experiences will change your image of sailing forever. 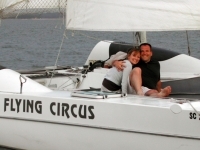 Whether it’s dolphin watching, daytime cruising, taking in a fabulous sunset, learning to sail with a private lesson, enjoying fireworks, or just getting together for clean, fresh fun, PAU HANA and FLYING CIRCUS are perfect for all ages. 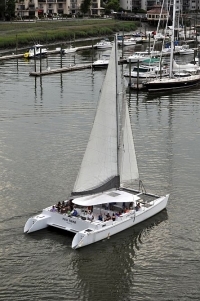 Catamarans do not “heel” like traditional sailboats – you can enjoy your favorite libations without spilling a drop of your drink! It’s relaxing and stress-free, with 360 degree, unobstructed visibility all around. Our USCG Licensed Captains and mates are very personable, have excellent sailing skills, as well as extensive knowledge of the area’s history, folklore, wildlife, and amazing eco-system, which they enjoy sharing with all our guests. The vast sea marsh surrounding the area is a nursery for animals of the sea and land – you never know what you might encounter in or out of the water! 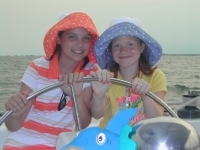 Sail away from the crowds on a personalized dolphin watch/nature adventure with your family, friends or group outing. 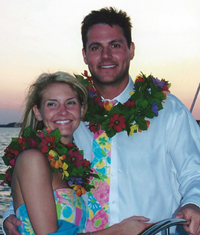 Private charters are available to celebrate every kind of special occasion! 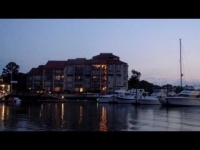 We are conveniently located at Palmetto Bay Marina, under the Cross Island Parkway Bridge. No gate fees. 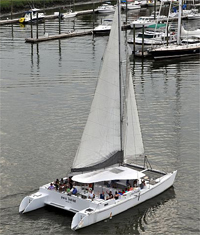 Hilton Head Island’s biggest catamaran sailboat is 53 feet long by 26 feet wide. USCG certified. There is a spacious hard deck area with 50 comfortable seats throughout, plus lots of walk-around deck space. Uncrowded. We limit to 43 guests maximum so there is plenty of room for everyone. You can have your choice of sunbathing, or relaxing in the shade, under the hard bimini cover top. PAU HANA is very “family friendly” for all ages. You do not have to stay seated in one place. You can move about in a safe and stable environment (no open railings, solid sides) viewing nature and marine wildlife from all areas on board. Our crew enjoys sharing information and insights about this wonderful island that we call “home”, in a personalized casual manner (no microphones). We play a variety of music. You are welcome to bring along a small cooler with your favorite food and beverage. Water and soft drinks are available for purchase. Rest room on board. 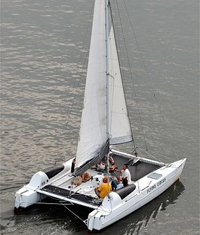 This very popular, fast and fun, former racing catamaran sailboat is 27 feet long by 16 feet wide. It is limited to 6 passengers maximum (plus captain), for comfort and intimacy. There is a hard deck area with padded cushioned seats, plus you are welcome to ride forward of the mast on the netting (made of soft trampoline-like material). 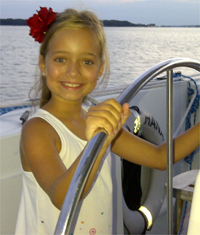 Our friendly and knowledgeable captains provide a unique individualized private experience for all ages. Enjoy an exciting nature and dolphin watch, smooth sailing cruise from a perfect, close to the water viewpoint. It is very relaxing and stress-free fun. You do not bounce around, as on small powerboats, or have to listen to constant engine noise – it’s just “pure” sailing in tune with the quiet harmony of Nature. FLYING CIRCUS is ideal for that small group adventure. 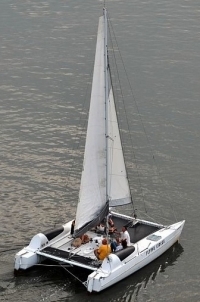 We offer personalized sailing lessons with USCG licensed and experienced captains. Small coolers with your favorite food and beverage are welcome. Head on board. Sunset dolphin watch sails are our specialty. After an adventurous day of biking, or playing on the beach, golf course or tennis courts, treat yourselves to a fun-filled evening sailing on the water, viewing a magnificent sunset. Bring along a cooler with your favorite food and beverage to toast the end of the day admiring Mother Nature’s beauty. 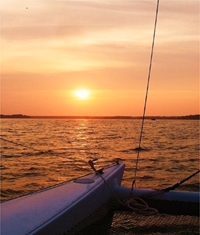 It’s Hilton Head Island’s BEST sunset “Happy Hour” sail! 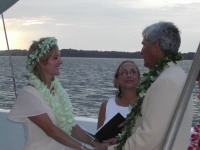 Truly unique party venues, PAU HANA and FLYING CIRCUS are perfect for celebrations of all kinds – birthdays, anniversaries, weddings, reunions, neighborhood get-together, corporate and social outings, bachelorette and pre-wedding/rehearsal parties – to name a few! Whatever your special occasion, each private sail is customized just for you. Self-catering is welcome or we can recommend different catering options that are available. Experience Nature at its finest. 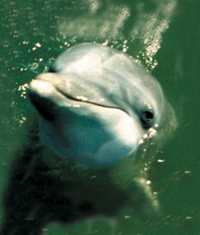 View dolphins and the surrounding Low Country’s amazing habitat from a unique perspective. See an abundance of wildlife on our eco-tours as we quietly sail through the local waterways. Encounter local and migrating Atlantic Bottle Nose Dolphins; wading Egrets and Heron; soaring Ospreys and Hawks; Ibises and Wood Storks taking off from the marshes to return to their evening rookeries; diving Brown Pelicans, Cormorants and Loons; scavenging Sea Gulls and Terns as well as a variety of birds skimming close to the waves; and just maybe even a Loggerhead Turtle, Stingray or Manatee. The “friendly cannonball” Jellyfish floating near the surface and Atlantic Blue Crabs “swimming by”, are also often observed in the nutritional healthy waters of the Calibogue Sound and Intracoastal Waterway. The majestic Live Oak trees and swaying cord grass Sea Marsh lining the shoreline provide shelter for a multitude of sea creatures and wildlife. Every season brings with it a wonderful dynamic display of the constantly ever-changing flora and fauna. Our captains and crew love to share their knowledge and help educate you about our amazing ecosystem and its inhabitants. 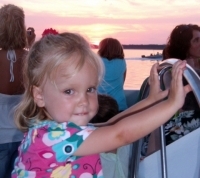 Hilton Head Island is well known for being a wonderful place to bring your family. 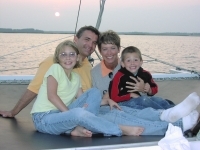 Many have been coming here for years and joining us on board one of our cruises as part of their annual vacation. We provide a great opportunity for some special family bonding on our interactive dolphin watch sails. 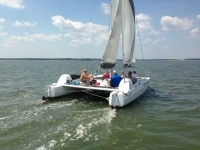 Both catamarans are excellent for all ages. We have hosted guests from 2 weeks old to 97 years young. 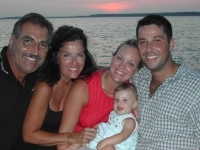 Our captains and crew will help create some magical moments and fond family memories for years to come! The fastest way to contact us is via phone.